● Keep power devices (e.g. ballasts) and junctions away from or above any potential water spillages and flooding. ● Determine whether the electrical lines and connections can handle the current draw. ● Where multiple lamps are being lit ensure to stagger start up times. ● High lamp current will cause burning of the timer’s contacts unless relay switching is used. 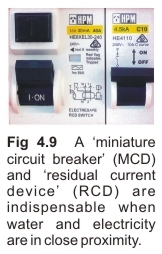 ● Install a miniature circuit breaker (MCD) and residual current device (RCD) as an overall safety measure. If there is a faulty circuit these will cut the power supply (Fig 4.9). Cost of power per day = Cost of power per kilowatt* x Total kilowatts** x daily duration.